Whether you want to replace, improve or completely overhaul your boat’s lighting setup, doing it yourself can be a very personally rewarding project. It is not for everyone. There are many challenges along the way, especially when dealing with equipment that will be in continuous contact with water, and on which you could possibly rely for safety when out in the water. Here are some tips and tricks related to DIY boat lighting installation to get you started. When it comes to boats, the need for quality is higher than your run-of-the-mill lighting. Boat equipment, be it stereos, navigation software and hardware or, of course, lights, face the weather and salt and are in continuous risk of water damage. It is important to give some thought to the price/quality relation of the products you purchase for your boat. Products that are simply too cheap to be good are likely to need replacement after a short period of time, which will double your budget as you get replacements. If you have any questions or can’t find what you want at a reasonable price, contact Imagine Marine and we will do what we can to help. Marine LED lights are an incredibly useful resource for your lighting needs. They withstand the wear and tear of the boating life, are more energy efficient than other options such as incandescent bulbs, and last much longer too. 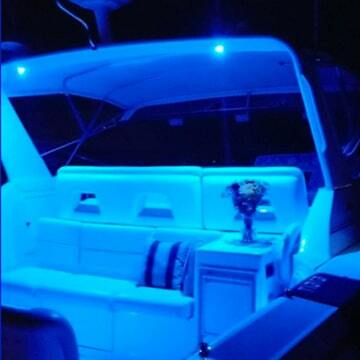 You can use LED lighting in the interior and exterior of your boat, as well as underwater and on your dock. This versatility is bound to provide you more bang for your buck, as you can easily adapt LED lights to work in different scenarios. Speaking of adaptability, smart LED lights give you the opportunity to control color schemes and light intensity through apps, so you can set the mood for any occasion. If you need fishing lights, some say that switching your LED lights to green can help you draw fish in. If you are planning on setting up navigation lights, or you are planning on revamping existing lights on your boat, keep in mind that there are legal requirements you must abide by. These regulations depend on your location. Generally, you are required to have specific navigation lights on when between sunset and sunrise, or when visibility is limited. When choosing your lights and designing your layout, it’s good to check for requirements and restrictions. When DIYing, there’s a tendency to want to start immediately after you have all the needed equipment. With light installation, sitting down to plan your layout will quickly pay off. For starters, it’s important to consider wiring and ease of access for maintenance. Place lights where it will be easy to access in the future, for maintenance and replacement. It is important to understand the schematics of your boat and plan your wiring accordingly, to avoid confusion and clutter. If you are piercing through the hull to place the lights, this requires care as you run the risk of piercing through an important element of the boat. These tips and tricks should help you plan out your light installation. However, if you feel like you are in over your head, call us. We can finish up the job, or work with you to complet the product. There is a wide range of LED lighting for boats available in stores online. Here at ImagineMarine, we carry a huge range of lighting equipment at different price points, we provide advice to all our customers, to ensure that everyone gets exactly what he or she need.